This mod disables the NES console Lockout Chip. The mod enables playing Import Japanese Famicom game carts in the NES with a adaptor that does not include the 10NES chip. A huge library of Japan only Nintendo games to discover. Another benefit is the reset flashing light boot errors is now fixed for NES carts. DinnerX wrote: Handy guide. Stupid 10NES chip. One thing though, don't the 60 to 72 pin adapters inside NES cartridges include a 10NES chip? As I understand it the adapter would have to include a 10NES, because the famicom boards used with them weren't modified in anyway and the console's 10NES has to connect to another 10NES to let the game run. If the Nintendo adapters do include a 10NES chip then I wouldn't have to disable the console's 10NES to play import games. After this mod is completed, you would need a 60 pin to 72 pin game cart adaptor. There are adaptors to convert both the 60 pin Famicom and 72 pin NES game carts. An inexpensive way is finding Import Adaptors already inside certain NES carts. 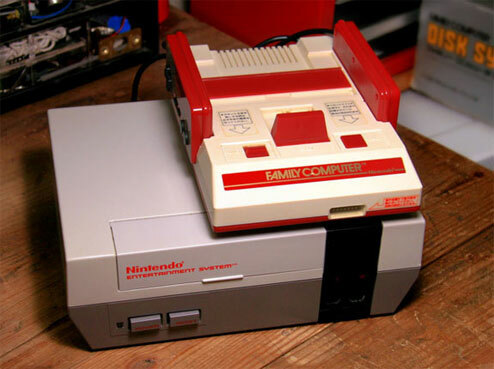 CRTGAMER wrote: To discharge any stray electricity in the capacitors, unplug the NES, press the power and reset buttons on and off a few times. 1. Flip the NES console upside down. Remove the five screws holding the two haves together. Turn rightside up and remove the upper shell. 2. Remove the the screws holding the upper RF Shield and remove the shield. You can now see the cart slot and how the push lock of game carts in the slot works. A closer inspection reveals why the pins eventually fail from the constant pushing up and down. 3. Remove the screws holding the cart slot and PCB. Note that two of the screws on the cart slot are longer, remember where they go. Don't forget the two lower screws by the RF modulator. When lifting the PCB, be careful not to strain the electrical cables. The cart connector does not have to be removed from the PCB, lift out as one unit. If the cart connector is defective, it is an easy repair or replacement, just slide out. The Nintendo brand connector might be of a better quality metal over an aftermarket replacement. It is best to try to repair by slightly rebending the pins. 4. Carefully lift the PCB and flip over, watching the electrical cables. The blue connector can be removed, it might interfere with the lower RF shield. The smaller connector is fragile, avoid unplugging that one. 5. Identify which chip is the lockout chip. Various NES models have different numbers, look for a couple of features. See the pic below, I have a small jewelers screwdriver pointing to the chip at the lower right. Continued in the next Reply. Last edited by CRTGAMER on Mon Apr 18, 2016 9:30 am, edited 47 times in total. NES Lockout Mod continued from the OP above. 6. Identify the leg on the chip that needs to be cut. It is leg number four as shown in the pic. 7. Cut the leg next to the PCB, leaving room to solder a wire on the leg. Due to the tight clearance, do not use regular wire cutters. If you don't have a precision small cutter, use a very small slotted jewelers screwdriver. Carefully scrape away at the number four leg where it is connected to the PCB. After the leg is cut free, bend it up slightly to ensure the connection is severed. 8. The mod should work at this stage, but it is a good idea to properly ground the severed leg. The chip will still work if you do not want to solder, but a good preventative measure. I jumped a wire from the severed leg to leg number 14. Chip legs 11, 12, 13, 14 and 15 are all linked to Ground. When soldering, tin the wire ends and chip legs separately first with a little solder. Let the chip legs cool, then solder the wire onto each chip leg. In the pic below the bottom wire connection is on leg number four only. It is not touching leg number five. I should not have cut so much insulation away before soldering. The joint is clear with the chip leg bent up, not worth redoing with heat damage risk. The other end of the wire at the top is on leg number fourteen. 9. Reassemble the NES. Be sure to start all screws at each stage before tightening any down. CRTGAMER wrote: The black plastic housing over the game cart connector has a tab that goes UNDER the PCB. To confirm the Mod works, turn on the NES without a game cart. The red light should stay on and no longer reset blinks. Next, test a regular NES game cart. Finally try a Famicom cart with an Import adaptor. In the pic below I have an adaptor inside a Gyromite NES cart. I have a strange 60 pin bootleg cart made by Power Joy Navigator. In testing I had no luck with the bootleg cart, I suspect it is not compatible as a real Famicom game cart. Perhaps the bootleg cart could also be defective, purchased at the Swap Meet. This mod works since the NES light now stays on, even with no game cart inserted. The regular NES carts all work fine. Since the lockout chip detection is now bypassed, the game carts no longer will get the dreaded flashing red reset light boot errors. I also tested a FC bootleg cart, it worked fine. Information in a couple of replies down. See my next reply in getting a NES cart converted with a FC game PCB. Last edited by CRTGAMER on Mon Jan 09, 2012 12:09 pm, edited 11 times in total. Handy guide. Stupid 10NES chip. One thing though, don't the 60 to 72 pin adapters inside NES cartridges include a 10NES chip? As I understand it the adapter would have to include a 10NES, because the famicom boards used with them weren't modified in anyway and the console's 10NES has to connect to another 10NES to let the game run. The Nintendo brand adaptor does have the 10NES chip, I added your Quote to the OP. I confirmed with a pirated FC cart that the Nintendo adaptor works fine on both a modded and unmodded NES. Note that its a pirated FC cart, not an original FC cart which should have the same results. The mod does get rid of the flashing light reset check, may help in troublesome game carts booting up. Also any adaptor without the Nintendo NES10 chip will now work with the NES console mod. There are a couple of ways for Nintendo Family Computer carts to plug in the NES. Get a dedicated FC 60 pin to NES 72 pin adaptor. You can also cut the top off a NES game cart that has the import adaptor inside as Hobie did. This works great, especially when you have multiple FC carts to try on the NES. The adaptor and FC cart will be a little shorter then a regular NES cart so you have to reach in a little on the Toaster NES. Note the added pull cord. A great solution to support multiple FC carts. This saves the hassle of taking apart a NES cart every time you want to try a different FC cart. For just one FC cart and a cleaner look, you can also swap out the game PCB from the inside of a NES cart that has an import adaptor. Remove the five screws on the NES cart and remove the back. The center screw plastic is keeping the original NES game PCB from popping off the adaptor. Loosen the two screws on the adaptor so the original game PCB can be pulled out. The Super 66 FC cart casing has no screws, it just pops apart. The Pirate cart PCB has no hole for the center screw, there is a chip there. Note that there are some FC game PCBs that will not clear the center plastic screw hole and support. You could crack the PCB if you tighten the adaptor screws. On the NES cart case, use a dremel and cut out the plastic of the support and the center plastic screw hole. In the pic below, note the center support and the center screw plastic in the NES cart and the center chip on the Super 66 game PCB. The NES cart center plastic will have to be removed to clear the replacement game PCB. After trimming off the center plastic, the Super 66 game PCB plugs in easily. Tighten the two screws on the adaptor. Without the center plastic, the game PCB can still be swapped out. The back plastic does not need to be trimmed but the hole is exposed. To prevent putting a screw in, a little piece of plastic with dab of glue does the trick. I used a piece of black plastic rod from the inside of the FC pirate cart, a perfect fit. Covering the hole prevents years later forgetting about the center chip PCB and accidently adding a screw. After the glue drys, replace the back with the four outer screws, keep the fifth screw as a spare. The Super 66 game PCB fits in the NES cart after trimming both the center support and center screw plastic. The Gyromite game PCB is not as wide, will not work with the FC pirate case in a Nintendo Family Computer unless plastic is added. It can be still be used back in its original NES adaptor cart after pulling the back screws and case cover. But now the inside screws do not have to be loosened. Test the new FC converted to NES game cart. Once satisfied, you can create a new label to finalize the project. Either Google images, scan or take a digital shot of the gutted FC cart case with a decent camera. I used a five megapixel camera. Use your favorite paint program to crop and touch up the JPG of any defects and tears. You can also crop just the title portion, rotate and add it for the edge part of the label. To get the right pic size, I compared jewel case covers I previously printed out. Compare the CD cover and original NES cart label for sizing up the JPG on the same CD cover saved in the computer cover program. Add the new JPG on top, and adjust the size. Delete the older CD cover JPG underneath and save as a new file. I put a black border around the cart JPG larger then what I guesstimated the NES label size would be. Easy to cut away the excess border to fit. Before cutting the printout place a clear transparency protector sheet or wide clear tape on the front. The clear tape is thinner but tends to bubble. Use double sided tape or non foam carpet tape for the back. After the tape is placed on both sides, cut out the print. It can be over sized slightly to cover the old NES cart label, scrutinize the end label so not to cut too short. "Blue Painter" removable tape can be used if doubled over in the back of the new label. This allows removal of the new label to restore the NES game cart back to the original condition minus the center back screw. However, due to the low adhesion of "Painter" tape, the new replacement label may tend to peel up on its own. The FC cart and modded NES cart label comparison, the NES also has a new end label. The printout came out darker, quality will depend on your JPG and printer. All the tears are touched up with a paint program but a tape bubble line is on the replacement NES label. A tradeoff when using thin clear tape over a thick transparency protector. So is this worth destroying a rare NES Gyromite Import Adaptor cart for a pirated FC 66 game? TEN guesses on this older GEN mod, I'll review the Super 66 game cart in my next reply. Last edited by CRTGAMER on Thu Jul 07, 2011 10:04 pm, edited 31 times in total. CRTGAMER wrote: So is this worth destroying a rare NES Gyromite Import Adaptor cart for a pirated FC 66 game? Its TENGEN TETRIS, reviewed further down this post. The Super 66 game cart has a great collection of NES games all convenient on one cart. A simple push of the reset button to try a different game. I don't get the cart label of Cowboy Mario in the gunsights, maybe to signify the lightgun games in the cart? Funny how some of the titles had a strange translation such as GALAZA instead of Galaga for example. Here is the complete list note the ones with Japanese titles have a *J in front. There is only one game name I can't figure out is number 60, an overhead view scrolling Ninja game that plays a lot like Front Line. The menu title is Knights Fight, but definitely no medieval theme here. Anyone know what the game described above might be? Maybe it is Zinja - Ninja? Zinja - This is a really weird game, another Famicom-only effort I suppose. A lot of the older Arcade games are near perfect emulated on the NES. There are all three Donkey Kongs, 1942, Galaga, Galaxian, Mappy, Pacman, Pooyan, Popeye and Xevious. Dig Dug is perfect, even the sounds the dragon makes when shooting fire. There is also the Joust inspired game Balloon Fight, a real classic. Of course Super Mario Bros and Duck Hunt made the cut along with another lightgun game Hogan's Alley. I remember playing Ice Climber years ago on an 8 bit computer forgot how fun it was. Other classics include Bomberman, Loderunner, Arkanoid, and Battle City. Raid on Bungeling Bay is even here, a helicopter game that got a lot of play time on the C64. Now if I can only find an Arkanoid NES Spinner. There is an earlier version of Bullet Proof Software Tetris for the FC, you can see the roots of the official Nintendo NES release. The controls are reversed, rotate the block by pressing down with the DPad and instant drop with the fire button. The real jewel is Tengen Tetris which is usually labeled as Tetris 2 on most pirate carts. The official recalled Tengen Black cart is a rare expensive find. However most pirate carts that have Tetris are this exclusive two player version. Too bad Tengen Tetris was pulled from store shelves, it is a far better game the the final official Nintendo release. I had to get this game to see what all the fuss is about. The graphics and music are not as good as the official Nintendo version, but the two player mode is beautiful. Play against each other or even better in Co-Op mode. A battle of wits beating each other dropping your lego block to fit. There is also a play against the computer as well as Co-Op with the computer. Same thing, slide your block ahead of the Co-Op computer and beat it to fill a hole. The computer controlled piece instantly reacts by sliding over to the next best hole. The lost Team Play level has not been duplicated again until the Wii version. tsr: Do you know how many Tetris Tengen carts did eventually sell? tsr: Yeah, it still has some value now even though it's certainly not the rarest game out there. It's just got the story behind it. EL: There's that, and I think people appreciated it when it came out. People rented the game from Blockbuster Video, came back, said "Oh, I lost it, here's your fifty bucks"... So it did disappear from Blockbuster and all of the rental stores quickly. tsr: And finally, which version of Tetris do you like the best? EL: There's no doubt in my mind. I've played the other one, and I said "Oh, you've gotta be kidding me!" (laughs) It wasn't tuned right, is what I remember. One of the secrets of the business is logrithmic tuning. If you want something to be twice as hard, you don't make it twice as fast! You make it just a little bit faster, and it turns out that much harder. Was the modding the rare import adaptor Gyromite cart worth doing? For money value probably not, but for gameplay value an absolute yes! In reality I can reverse this with another Gyromite 5 screw housing. 66 games including especially that little drop the blocks two player rare game! Nice being able to play a bit of lost gaming history, playing Tengen Tetris on the original console and controllers. 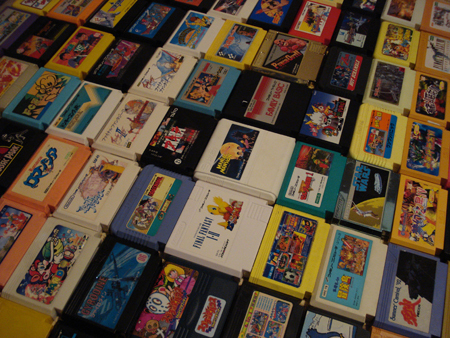 Here are some links with great reads about the Tengen Tetris recall. Last edited by CRTGAMER on Mon Apr 18, 2016 9:39 am, edited 10 times in total. is the left cart a pic of a nes game on a convertor to play on an FC? vlame wrote: Is the left cart a pic of a nes game on a convertor to play on an FC? I think you meant the NES cart on the right. The FC does not have a "region protect" chip so it will plug right in and run fine. The left cart is a Family Computer cart with a NES adaptor. This will work with the NES mod in the OP. yea whoops i meant right, any idea where i can get one of those? vlame wrote: yea whoops i meant right, any idea where i can get one of those? No idea, Google and have a lotta cash. Cheaper to just have a NES on hand. CRTGAMER wrote: To confirm the Mod works, turn on the NES without a game cart. The red light should stay on and no longer reset blinks. Next, test a regular NES game cart. Finally try a Famicom cart with an Import adaptor. In the pic below I have an adaptor inside a Gyromite NES cart. I have a strange 60 pin bootleg cart made by Power Joy Navigator.